Kurkure is a variety of ready-to-eat crisp, salty snack known for its unique taste. It was launched in 1999 by PepsiCo India. This product is promoted by leading celebrities with fun and lovable human quirks. Kurkure is gaining popularity day by day as the product is coming up with varieties of local tastes, what they promote as ‘Desi tadka'. It has become a common snack and a must-buy item in our grocery list. You get to munch on it at tea time, weekend parties, birthday parties and social gatherings. To beat all these, there are so many recipes that have come up with Kurkure that you can relish on. When it comes to the yummy varieties of Kurkure, we often tend to overlook the nutritional facts of the product and of course, the rumors that it contains plastic! Any product, before being released into the market for consumers, has to undergo certain protocols to get certified for its safety standards. The Kurkure manufacturing unit undergoes regular audits from recognized national and international food health organizations. So, this product does not contain plastic and it is safe! The product is definitely safe, but is it healthy? Let us look into the ingredients and nutritional information. Its main ingredients are rice meal, corn meal, gram meal (all highly refined ingredients) salt, sugar, oils and fats, spices and condiments. One serving of Kurkure (30g) gives you 168 kcals, 2.6g protein and 10.7g of fat (10.7g of fat is approximately 70% of your daily fat intake.) Since refined ingredients are used, all the vitamins and minerals are completely leached out. So, you end up getting only empty calories from fats and carbohydrates. And not to forget, it is very high in sodium. So it is not recommended for hypertensive and diabetic patients. So, if Kurkure is on your daily menu, imagine how many grams of fat would contribute to those unwanted calories and make you fat! I agree that we all crave for tasty, crunchy and yummy snacks. 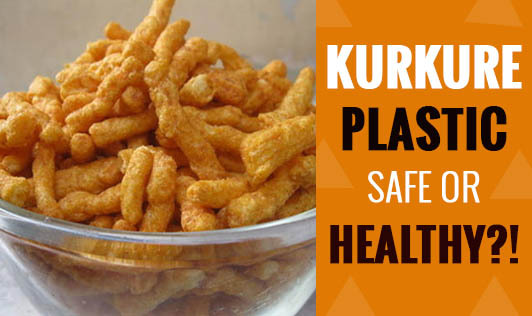 Unfortunately, Kurkure is not on the list as an everyday option for a healthy snack. Talk to your dietitian for healthy yummy snack ideas. I am sure you would like them!